My recent blog post – Youth & Nature: Is There Hope? – sparked a lot of interesting discussion on the role that technology plays in connecting and inspiring young naturalists. I mentioned in the blog post that screens tend to consume hours of young people’s time that could profitably be spent outdoors. However technology clearly has many benefits as well. In this blog post, I’ll mention some of the many ways in which technology is aiding the development of young naturalists. July 2016, the incredibly popular game Pokemon GO was released. The objective of the game is to go in search of Pokemon characters, and ‘catch’ them. This got hundreds of millions of people outside, doing an activity which could be equated to geocaching. But the problem was, were they really interacting with the natural world, or were they too engrossed in their screens to pay attention? In my opinion geocaching is much better for getting children outside. It’s like a treasure hunt, where families can follow co-ordinates through wild landscapes to find hidden boxes. Many nature reserves and other wild spaces have geocaches hidden inside, and the fact that you are actively looking for a box in real life rather than on a screen means that you are far more attuned to the natural world around you. And when you’re out there, exploring, looking for geocaches, the chances are that you will bump into some brilliant wildlife. Furthermore, technology has been incredibly important in connecting most of the young naturalists I know today. Using platforms such as Twitter and Facebook, young naturalists have been able to share their work and discuss ideas. Without a doubt, social media has given many young birders, botanists and all-round naturalists the support they need from others to get them going. It may be, for some naturalists, that the daunting prospect of identifying things that they see is off-putting. One used to have to spend hundreds of pounds on literature to master even a single group like fungi before technology. Now on social media like Twitter and Facebook there are accounts, groups and pages especially to help people identify what they have found. One example is the @MothIDUK Twitter page set up by Sean Foote, which answers many ID queries from puzzled naturalists every day. Without a doubt accounts, groups and websites like this are making naturalists’ lives far easier, and allowing them to enjoy nature that extra bit more. Collins Bird Guide is one of several apps that have increased people’s connection with and knowledge of the natural world. Finally, there’s no way that I would be writing this blog post without the help of technology. I wouldn’t be able to raise the issues of youth & nature, and the benefits of technology. I’d like to thank people like Calum Urquhart, Dara McAnulty, Megan Shersby, Josie Hewitt and others who reminded me that technology, although it can distract from the natural world, can also be incredibly useful for connecting existing naturalists and inspiring new ones. There are probably several points I’ve failed to mention here; and as technology advances I’m sure that the number of ways in which it benefits naturalists will increase. It’s always a treat for me when something wildlife-themed comes on to the TV, and at the moment I am spoiled for choice. There was a fantastic documentary on Chris Packham and his Asperger’s and next week Autumnwatch returns. One programme that really caught my eye was H is for Hawk: A New Chapter. 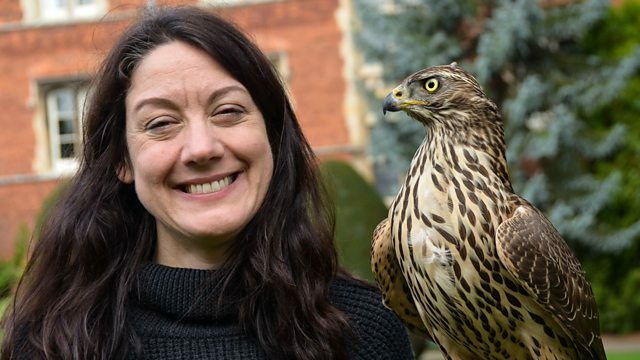 H is for Hawk: A New Chapter is a BBC documentary presented by Helen Macdonald, the author of a book of the same name on how she trained a Goshawk (one of the trickiest raptors to train) called Mabel after her father’s death. The documentary is almost a film rendition of the book, however this time Helen is training a new Goshawk who she names Lupin. Falconry is not something I’ve really looked into before, so the film was really interesting in that it showed how falconers train their birds and the patience that it requires. Included are a few old traditions and superstitions that really are fascinating. And not only was it good from a falconry point of view, but it also showcased the lives of wild birds when Helen tried to watch some of her own. Emotional is not a word I’d usually use to describe nature-based documentaries and films, yet this production was full of emotion as I learnt about the emotional connections between Helen and Mabel and her father. The snippets of reminiscences really helped to tie together a documentary that was informative and enjoyable. While watching the documentary, I recalled the occasion when I saw my first wild Goshawk. Although it was only a glimpse, it was very memorable. It was at the time of year when birds are displaying prior to the breeding season, which makes them more visible as they arc over the forests. Below is a drawing of the encounter. I would thoroughly recommend watching H is for Hawk: A New Chapter. It is available on BBC iPlayer here. The nights of 12th, 13th and 14th October were moth night 2017. You may think that dates so late in the season may not be great for moths, however there is still a surprising amount of diversity on the wing, including scarce migrants. I put my MV light trap out on the Friday night, and I too was actually quite sceptical about catching many moths. Although my garden regularly attracts upwards of 200 moths a night during the summer months, it is far less reliable in the autumn and winter compared to other sites, for an unknown reason. However, I was in for a pleasant surprise. Checking the trap at 7am, I could instantly see that it was much busier than I was expecting. The wall of the house near the trap was carpeted with Red-green Carpet moths, one of the most attractive Geometrid moths (the carpets, pugs and waves). There was a Snout moth on the white sheet beneath the trap, a Black Rustic in a gap between the patio tiles, and within the trap itself was my number one target: a Merveille du Jour. This was the first Black Rustic I have ever caught, which is overdue as they’re not an uncommon autumn species. This Red-line Quaker, named after the red line at the end of the forewings which is more obvious in real life, was a nice addition to the catch. Its cousin the Yellow-line Quaker is less commonly attracted to light and is best found by searching Ivy flowers after dark. This rather dull-looking moth is a November Moth. There are two species of November Moths that are very similar and can only be separated by dissection, the November Moth and the Pale November Moth. Therefore most people record them as ‘November Moth aggregate’. Whoever named the Merveille du Jour (translated from French as Marvel of the Day) was not over-exaggerating. This species is often regarded as the holy grail of autumn moth-trapping; its exquisitely detailed markings and colouration are hard to resist. I’ve only caught one previously, so I was ecstatic about this! Another highlight was a Barred Sallow moth, one of those species where you can easily tell what it is supposed to be camouflaged as. It has patches of russety-brown and warm yellow, that perfectly match the colours of autumn Birch leaves. It’s certainly an effective disguise, which must have taken millennia to perfect. To finish off this blog post, I will leave you with a video of the Merveille du Jour. In the video, you can see that it is vibrating its wings. As moths are nocturnal, they cannot get direct energy from the sun (although they do get indirect energy from the plants that they eat), so they have to shiver (like humans do) to warm up their flight muscles. I used a lower shutter speed for this video, which appears to slow the vibrations down and they are shown as a ripple through the wings. If you are viewing the email version of this blog post, the video may not show, so I would recommend visiting the site directly to watch it. Don’t worry – all moths were released unharmed!